The recently released science fiction film “The Wandering Earth,” adapted from a story by Chinese bestselling author Liu Cixin, has enjoyed heavy promotion by Chinese media. The film, which had a Lunar New Year opening on Feb. 5, has been turned into a medium for political propaganda, with moviegoers finding the slogan “only the Communist Party can save Earth!” emblazoned on their admission tickets. 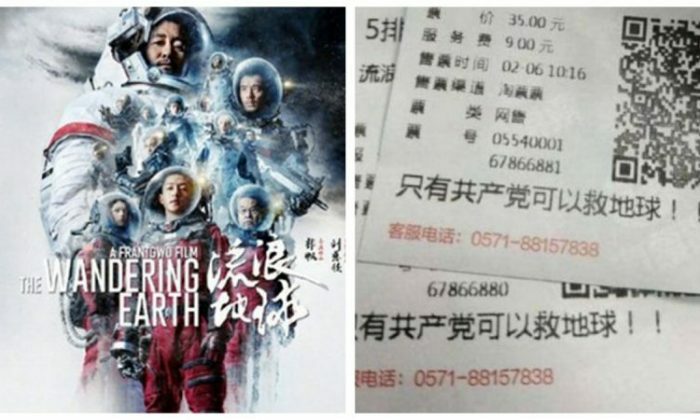 On Feb. 6, photos taken of two movie tickets bearing the slogan quickly became an internet sensation. The tickets were purchased from Alibaba Pictures Group, a film company under Alibaba Group. According to Hong Kong’s Apple Daily, some Chinese netizens verified the information from those who purchased the tickets as being genuine. Liu Cixin, who is the author of the famous “Remembrance of Earth’s Past” trilogy, wrote “The Wandering Earth” in 2000. The story posits a near-future apocalyptic scenario in which the sun is turning into a red giant. This prompts a unified mankind to build giant fusion-powered thrusters around the globe in hopes of propelling the earth out of the solar system in search of a new star. The film adaption, directed by Guo Fan, depicts the earth-turned-spaceship on its perilous journey, and was soon promoted by state-run mouthpieces such as People’s Daily and Global Times, which played up nationalist themes in the movie. “The Wandering Earth” has been a box office hit in China, pulling in $298 million in ticket sales as of Feb. 10. But Chinese netizens reacted with scorn to the pro-communist slogans printed on the tickets, with many deriding it as mentally ill.
Other netizens criticized the Chinese Communist Party (CCP), which is near its 70th year in power, for its atrocities and disregard for human life. “The Cultural Revolution killed so many people, and now PM2.5 [air pollution] and HIV-contaminated vaccines are all threatening the elimination of humanity. When all human beings die, the earth will be certainly become safer and better,” one wry comment went. “Wandering Earth” had a budget of $50 million, making it China’s first big-budget science fiction film. Reviews have noted the movie’s ambitious scale, as well as its notable lack of American characters. Film and other entertainment are subject to strict censorship by the CCP, and producers often gear their content to avoid backlash, lest their artistic creations and reputations suffer. The CCP regime and the United States have been at odds since last year, when the Trump administration took Beijing to task over its protectionist business practices and regime-sanctioned industrial espionage. Since April 2018, Washington has imposed tariffs on over $200 billion worth of Chinese trade goods. An earlier version of this article said that “Wandering Earth” depicted the United States as not being part of the United Earth Government in the film. In fact, the film presented the leaders of the coalition as being the five members of the real-life United Nations Security Council, including the United States. The Epoch Times regrets the error.